Burial Mound evokes an earthen structure (the eponymous 'burial mound,' referencing Midwestern sites like Cahokia) growing fur instead of grass — while also suggesting a site of worship or an altar, an archeological site, an animal presence, or a human habitation. At intervals, smoke drifts slowly from the central golden hole, as if food was being cooked within or incense being burned by unseen inhabitants — marking this as a special place of transformation. The feeling of presence/absence is also enhanced by the spectrum of flags, which seem to have been placed by a visitor or resident as a simultaneously celebratory and funerary gesture. 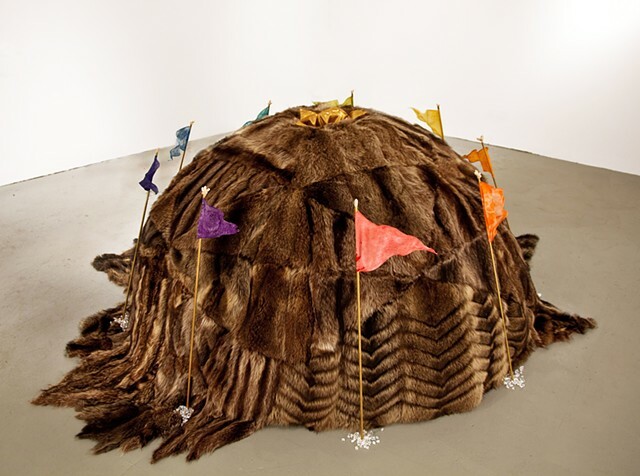 Unlike its companion piece, Therianthropy, Burial Mound has no door through which to physically enter, leaving the viewer to imagine themselves, perhaps in a transformed state, within.